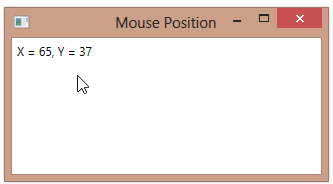 You can retrieve the current position of the mouse at any time using the Mouse.GetPosition method. Mouse is a static class that provides information about the mouse through a variety of static methods. The GetPosition method returns a Point object, which contains the X and Y position of the mouse, relative to a specified user interface element. In the example below, we call the GetPosition method and then set a property to report the mouse’s position. (We’ll bind a label’s Content to this property). Passing null to GetPosition means that we want the position relative to the top-level window.